TOKYO - Nikon Corporation (President: Michio Kariya) is pleased to announce that the European Imaging and Sound Association (EISA) has honored Nikon with two prestigious awards for three of its professional-level products. The D3 digital SLR camera was designated European Professional Camera 2008-2009, and the AF-S NIKKOR 14-24mm f/2.8G ED and the AF-S NIKKOR 24-70mm f/2.8G ED were named European Professional Lens 2008-2009. The D3 had already earned the CAMERA GRAND PRIX 2008 award from Japan's Camera Press Club, as well as the Best D-SLR Professional in Europe 2008 from Europe's Technical Image Press Association (TIPA), giving it a total of three major photo industry honors to date. Moreover, this year, 2008, is a commemorative year for NIKKOR lenses, given that it marks the 75th anniversary since the first lens was introduced in 1933. The award for these two NIKKOR lenses adds a memorable mark in the history of NIKKOR lenses. 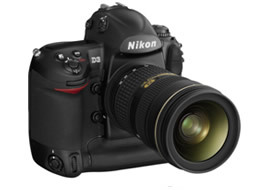 The Nikon D3 is the first full frame (FX format) Nikon, offering amazing image quality due to the fact that the pixels on the 12.1- megapixel CMOS sensor are much larger than usual. These large pixels help to produce very low levels of noise, even at high ISO settings. The high-speed operation and focusing, combined with the nine frames per second continuous shooting mode in FX format, make it a good camera for action and sports photography, as well as the ideal DSLR for all round professional photographers. This pair of NIKKOR zooms represents the ideal optical partnership to equip Nikon's professional full frame (FX format) cameras. Covering a broad focal range at f/2.8, and delivering very high optical quality, these zooms help to project Nikon's FX format DSLR system to the forefront of the market. With its amazing frontal lens and only the small handicap of a quite significant size and weight, the 14-24mm establishes a new record in the short focal-length zoom category compatible with full frame sensors. Its quality compares extremely well to that of fixed focal length lenses. The new 24-70mm is a superb lens, with an advanced optical and mechanical design that mark it out in the NIKKOR wide-standard zoom line-up. Its minimum focusing distance of 0.38m makes it an excellent general-purpose zoom. The official award ceremony will take place in Berlin, Germany on August 29, 2008. EISA is Europe's largest multimedia editorial organization, with a membership of 50 audio, video and photo magazines from over 19 European countries. Each year a panel of editors and technical writers from the organization's member magazines nominate the best equipment from different categories of audiovisual products released in Europe during the preceding 12 months. The information is current as of the date of publication. It is subject to change without notice.